Time Extensions – Transparency & Accountability? From 1 January to 30 July 2018 there have been 102 requests for an extension of time. In the 2017 calendar year 157 requests were received. This represents a relatively high volume of work and indicates that such requests are common. This is literally a staggering amount of applications. 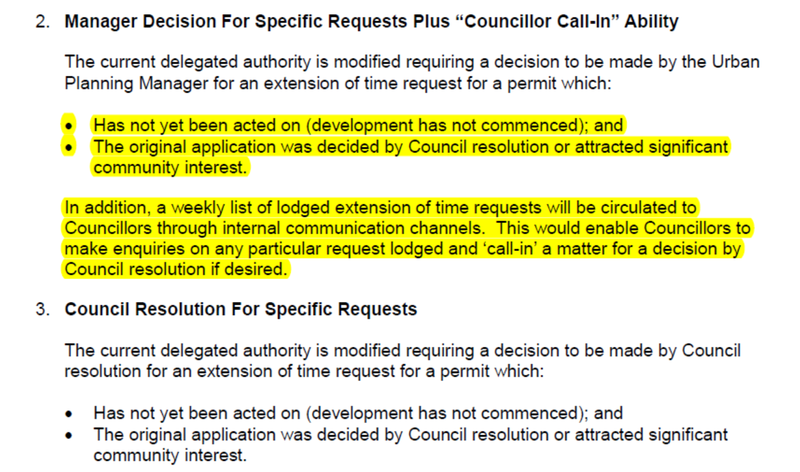 Yet the community has no idea how many of these requests for time extensions were granted, or refused. Most importantly we have no idea as to the reasons why they were either granted or denied. The issue of time extensions is important and has already been shown to have a decided impact on land use in this municipality. The most blatant example concerns an approved permit for 7 storeys in Centre Road Bentleigh. When the permit was granted by VCAT, there were no interim heights. In November 2017, after the amendment was introduced a council planner granted a time extension. Had the time extension not been granted then the developer would have had to put in a new application where the height restrictions applied – ie lower. Council thus provided the developer with a free pass to build his 7 storeys despite the fact that it is council ‘policy’ to NOT GRANT TIME EXTENSIONS IF PLANNING CONTROLS HAVE CHANGED. Below is an extract from a 2012 officer report which makes this abundantly clear. So why was this permit granted and if this is council’s policy then what were the reasons for the approval? Since the approval was granted under delegation, the question of how council handles its delegations becomes vital. More importantly, it raised questions of transparency and accountability. In March 2018, there was a request for a report to consider the issue. It’s only taken 5 months for this report to make it into the agenda! Excuses have been that council is reviewing its delegations! Please remember that it only took 3 weeks for council to change its delegations from one council meeting to the next (ie 1st May proposed delegations were deferred until 22nd May, when some major changes were added!). There is nothing (legally) to stop councils changing their delegations at any time. Thus why are we still waiting until the ‘near future’ as stated in the officer’s report? And what does ‘near future’ actually mean – 3 months, 6 months, another year? The report recommends option 2. The wording of the recommended option 2 is far from satisfactory. (1) It limits applications to those which were the result of council resolutions alone or which fall under the category of ‘significant community interest’. Very few decisions are made by councillors in planning – less than 5% of applications. Plus, who is to decide what constitutes ‘significant community interest’. Are we talking 10 objections, 15 objections or must the magic number approach more than 50? The final sticking point is that there will be no public disclosure of which applications have been lodged since this will only go to the councillor briefings. The online planning register does not detail this information – or certainly not on a regular basis. Option 3 is slightly better in that it calls for councillor resolution and takes it out of the hands of ‘managers’. There is however the repetition of what was stated in Option 2. Delegations which work in the community’s interests, not the developers! How bloody convenient. They’ve got it in black and white about what should be done and ignore it to give the developer a fantastic windfall. Heads should roll for this and councillors for once do the right thing and change these options. They won’t do anything to solve the problems. Poor original decision, poor delay in action and poor recommendation. Only in Glen Eira. This either stinks to high heaven, is total incompetence or both.The policy is clear as clear yet it doesn’t matter, they’ll just do what the developer wants. Looks that way. Much,much easier to give time extensions that go to vcat to fight them. Cheaper too. 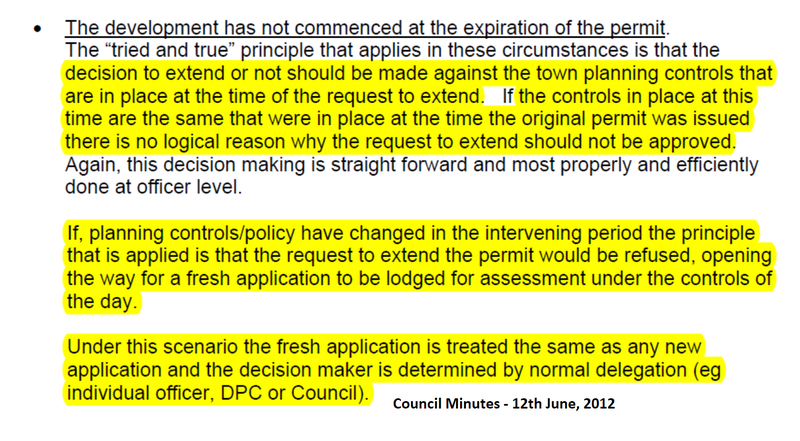 Council policy is useful only when it is used to deny residents, otherwise it is ignored completely. Is this evidence of Council pre empting significant changes to zoning laws that will enable increased hightlimits based on re zoning ? The large empty block in Wahgoo Road, Carnegie, once occupied by the splendid, significant heritage Victorian mansion which Glen Eira council dismally failed to protect and which was bulldozed and cleared of all established trees by its current owners,Jewish Care in 2015, remains completely vacant. Since it’s demolition and clearing, it remains undeveloped and an eyesore, surrounded by cyclone fencing. The area is classified as NRZ but Jewish care want to build a multi storey aged care home and it’s plans were blocked due to height and other amenity issues. Is Jewish Care planning to hijack planning zones, or is council planning changes that residents are not being informed of? Residents have lost faith in council. Some of us are thinking of leaving the area after living here for more than 20 years due to council’s abject failure to honour residents’ concerns regarding amenity and a sense that there are corrupt forces at work. This council ‘s failure at transparency is surely illegal? The permit/order for this development was issued by VCAT on 7th May 2016. The two year time limit for the start of development has therefore passed. The developer has 6 months to lodge an application for time extension on top of the order date. What is concerning is that residents do not have any idea as to whether or not an application for an extension of time has been submitted – that is how council operates and what needs drastic change. There is nothing ‘transparent’ about planning in Glen Eira. For example: this council only highlights what goes to VCAT. It does not present data on which applications have come in, which were decided under delegation, and what decisions were then made. Other councils regularly feature the full months report on ALL applications and all decisions – regardless of whether or not they end up at VCAT. Kingston is just one of these councils. A perusal of their agendas will reveal the how they are ‘transparent’ in their reporting. As for the zoning of Wahgoo as NRZ, this remains although the legislation has changed. In our view, altering the ‘residential aged care’ permit to straight out dwellings would require a new application and new permit since it would become a different use to that granted by the original permit. This makes me think how many other places got their extensions and no one is any the wiser. Not good enough by a long shot. No planning before so they could get seven and more storeys. Here was an opportunity to stop it and they buckled under. Not the first or last time this will happen unless councillors put a stop to it but I’m not holding my breath on that one. Extensions should never be granted, it should be mandatory for developers to resubmit applications thereby ensuring that developer’s meet current standards. Most extensions are granted due to the funds not currently being available to the developer; so what ? that is a separate financial issue not one council should entertain. This is a power thing that council workers like to exercise to feel important.